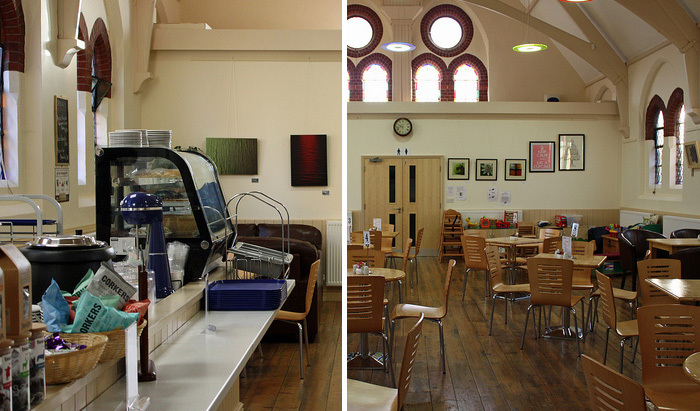 The Coffee Shop is the refurbished old Methodist chapel which was originally built in 1864. It has been completely modernised and decorated to a high standard. It is 12.7m long by 10.3m wide (42′ by 34′). It is equipped with a modern commercial kitchen – unfortunately this can only be used by qualified professionals. Access to the other kitchen can be arranged when required and other bookings permitting. The coffee shop can be accessed through the side entrance or through the two front doors which lead from the High Street through the entrance lobby with full toilet facilities. The standard hire rate for this hall for private parties and similar events is £30.00 per hour. A reduced hire rate of £24.00 per hour is available for classes or community events. Discounts apply to both rates for members (10%), for regular hire (10%) and single bookings of 3 hours or more (10%). The coffee shop is hired as-is and time will need to be allowed for moving furniture so it is how you want it and for reinstating the coffee shop at the end of the booking. Available outside the Chequers. Bike stands available on site, right hand side. Pushchairs can be parked/brought inside.